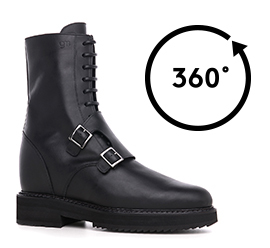 Up to 6 inches taller with this elevator boot in black full grain leather, tone-on-tone laces and double buckle. The rubber sole features seams at sight for greater durability over time. The new and comfortable GM elevator system, made of 100% natural raw materials, is able to increase height from 4 (10 cm) up to 6 inches (15 cm) allowing a better posture. A boot that complements perfectly both casual and formal outfits. The GuidoMaggi artisans also allow different customization options.